You can use the search box at the top right of that page to search for any terms you like. The document will then tell you number of times that search term occurs and also highlight the occurrences. Use the little up and down triangles at the side of the search box to move from one occurrence to the next. Windows users can also use “Ctrl” + “F”, Mac users try “Cmd” + “F” to search. Cost USD 40.00 incl of postage and packing to anywhere in the world. It is a paradoxical situation with Richter: he did not like recording but became the most over-recorded pianist in the history of the disc. He stopped making records for Melodiya, the Soviet State Record Company, in 1959, he shelved his plan to record his whole solo-repertoire in 1973. From then on it was stop and go with studios. 83 % of his discs were taken from live performances, sometimes with his knowledge, mostly without. Richter did care and he did not. He didn‘t like to be involved and was over-critical towards his own playing. But when he liked something his attitude could change completely. His records sold well and so he was under constant pressure to allow more publications. With the arrival of the CD and especially after his death in 1997 all floodgates opened and not many items of the Richter repertoire went unpublished – an amazing 90 % were recorded. The Beethoven Op 10/3 sonata alone was issued in 15 different versions – some recording venues only days apart. Record producers have a tendency to be none too exact when it comes to dates of the recording. Months and days are mixed up, years have been generously attributed where no such repertoire was played etc. The incredible multiplicity of information and detail which has piled up in Richter‘s recorded output makes for confusion. So outside help is needed to solve the remaining questions. The present work is based on Richter‘s own concertography which he kept in minute detail all his life and which allows the precise attribution of individual works to the concerts. So the Where? and When? Special care has been taken to identify performances and in this process the timings of the works have been very helpful. Furthermore they allow one to follow the development of the artist. Sometimes timings are inaccurate: some include the applause after a work, others leave it out. In cases of no reliable information is at hand, we say so. Despite painstaking attention to detail, pitfalls are part of this game. So we would welcome any comments and addenda so as to rectify inaccuracies. 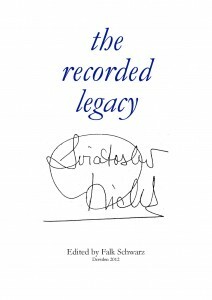 The list covers every known recorded work by Sviatoslav Richter – regardless of its medium. It is mainly a listing of CDs. Any format other than CD has the appropriate prefix: 78 rpm or LP, LD (laserdisc) and DVD, VHS tapes or SACD discs. Every recording carries the number of the first original publication. A work first issued on 78 rpm and later reissued on LP and CD carries the first number as well as the following numbers. All variations in LP numbers have been omitted. When a work has been recorded more than once, all entries follow in chronological order. Downloads are only listed when the recording is not available in any other medium or are difficult to get – some Russian downloads for example. Otherwise users should consult Amazon or ITunes store. On September 12th, 2012, 9.25 am, Amazon.co.uk listed 235 albums for mp3 downloads and 4.138 „songs“ (recorded items) by Richter.